I have configured a Sun Ray 2 in my bedroom without running any CAT5 Ethernet cable in my walls. I used a Linksys model WAP54G wireless access point configured in AP Client mode. It talks wirelessly to my Linksys WRT54GS router which is connected to my AT&T DSL Internet connection. I am using the Sun Ray's built-in VPN client to talk to the corporate firewall at work. Hi -- did you have any syncing problems with the sunray to samsung display? 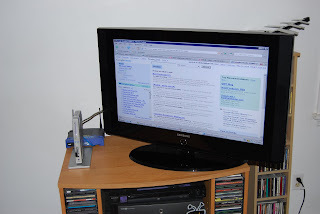 I have almost the same setup as you, sunray 2fs to samsung with dvi/hdmi cable. I can get a brief splash screen in 640x480 then it goes blank, did you need to hardcode resolutions somewhere?